Hoda Kotb gained fame as a television host and news anchor for NBC, she anchored the program Today’s show with the station and is said to be excellent with her skills on screens. This was later proven when she won the Daytime Emmy Award for her prowess as an anchor. Apart from her successful career as a host and anchor, she has done amazingly well as a television personality and an author. In 2011, she decided to spice up her career and featured on Martin McBride‘s music video, I’m Gonna Love You Through It, which became another platform for announcing her to the world. Hoda stands as an advocate for cancer awareness; a decision she took after she survived the disease. She is a married woman and a mother. Born Hoda Kotb on August 9, 1964, in Norman Oklahoma, the anchor was raised in Organ town and Alexandria but later moved to New Orleans, Louisiana. Her parents are Egyptians, her mom, Sameha made ends meet by working at the Libray of Congress while her dad, Abdel Kader Kotb is an energy specialist. She isn’t the only child of her parents and is one of three siblings, having a brother, Adel and a sister, Hala. Records also have it that her family once lived briefly in Egypt and Nigeria while she was a kid. Unfortunately, the anchor lost her dad in 1986, the cause of his death is yet to be revealed. For her educational pursuit, she attended Fort Hunt High School and graduated in 1982. She was the homecoming queen during her time and she also gave a speech during her baccalaureate service. She furthered her education at Virgin Tech and graduated with a B.A in broadcast journalism in 1986. As a result of her eloquent speeches while at the college she was later invited to speak to the graduating students in 2008; exactly 22 years after she graduated. In subsequent years after that, Hoda Kotb served the Virginia Tech Alumni Association Board of Directors for three years. Meanwhile, because of her outspokenness, Hoda Kotb got the position of an OAP at WXVT just within a short while after she graduated from college. There, she was an anchor and reporter all through 1992-1998. Upon leaving the radio station, she served as a co-host on the fourth hour of the Today Show and also became a correspondent for Dateline NBC. That same period, Hoda Kotb substituted as a host in place of Savannah Guthrie and Matt Lauer who hosted the show Today. Later in 2017, she became a permanent host for the show and was recruited as the third spokesman, nevertheless, few years down the lane, her colleague, Lauer was laid off as a result of sexual misconduct allegations and that automatically gave Hoda Kotb solid grounds with the team. Consequently, Hoda Kotb decided to tread the path of an author and wrote a few books including her biography; Hoda: How I Survived War Zones, Bad Hair, Cancer, and Kathie Lee (2010), Ten Years Later: Six People Who Faced Adversity and Transformed Their Lives (2013), Where They Belong: The Best Decisions People Almost Never Made (2016) and I’ve Loved You Since Forever (2018). Whilst growing her career, Hoda Kotb was diagnosed with breast cancer in 2007. It was really a difficult moment for the television personnel, all through the period that she underwent treatment for the disease, she had it all documented. Fortunately, she won the cancer battle and is currently, hale and hearty. That sprouted in her a desire to be an advocate for cancer awareness. Hoda Kotb is in a platonic relationship with a man named Joel Schiffman- a New York financier. The two met sometime in 2013 and have taken their affair serious. 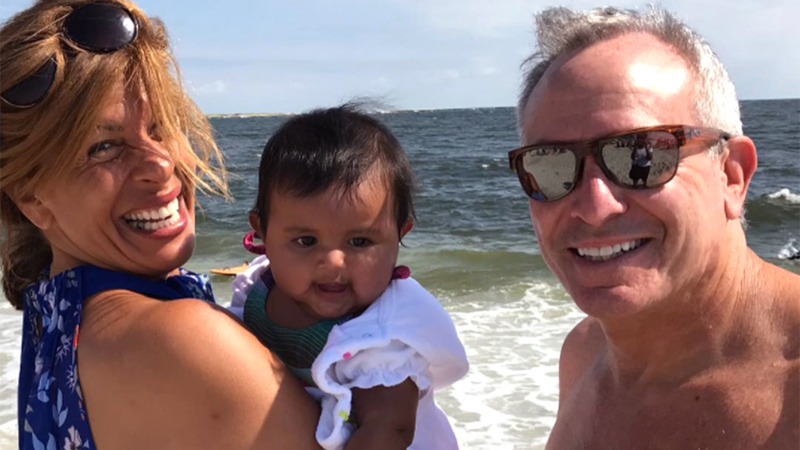 In 2017, the couple made a decision to adopt a kid after it was discovered that Hoda would never be able to conceive what with her battle with cancer. They named their baby girl, Haley Joy. Moreso, the couple are both divorcees, Joel Schiffman was previously married to a lady who he had a daughter Kyle, with. On Hoda’s part, she was previously married to Burzis Kanga, a former coach to the U.N.O tennis team, however, they divorced just two years after their union. Hoda Kotb’s parents are Sameha and Abdel Kader Kotb. Hoda stands at 5 feet 9 inches and weighs 72kg. She carries light brown hair with dark brown highlights. The journalist measures 38-30-38 inches for her bust, waist and hip size respectively.